Time to strengthen your party in this event with EXP, orbs, and Gil that are in abundance! The event will be split into 4 phases and each phase lasts for three days. 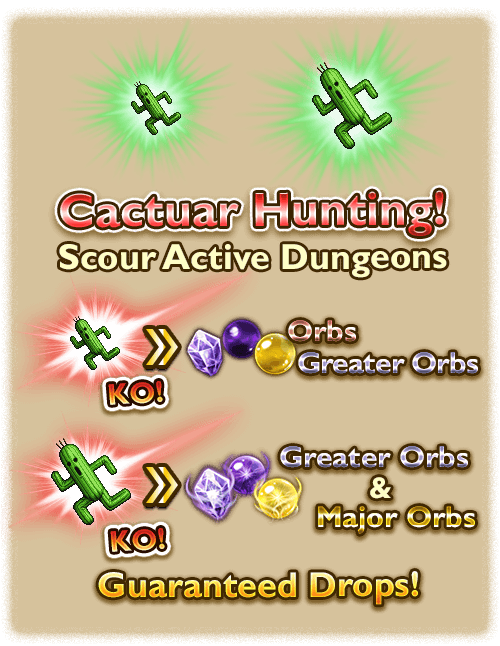 The Orb Dungeon will feature two rare spawns: Cactuar & Gigantuar. They can appear in any difficulty, but the chances of them spawning are higher as difficulty increases. Cactuars guarantee either a regular orb or Greater orb, while Gigantuars guarantee either a Greater orb or a Major Orb. There are no bosses in this event, the only real boss is RNG. Make sure you plan ahead what orbs you need and maximize your returns! Stamina refreshes are recommended! Go hard or go home! In Normal dungeons, regular enemies drop Minor (1★) orbs. In Hard dungeons, regular enemies drop Lesser (2★) orbs. In Heroic dungeons, regular enemies drop Regular (3★) orbs. Take a look at this informative video by lindmejo! Take note of the amount of Gil and EXP you can get during this event! Do the Cactuars/Gigantuars appear by themselves or with other enemies? Does anyone know at what rate Cactuars and Gigantuars appeared in JPN? And what % of those yielded Greater and Major orbs, respectively? Is it best to play the dungeons on easy after mastering each difficulty, to minimize stamina usage? Do the cactaurs spawn at the same rates in all difficulties? The spawn rates of the cactuars are lowest in Easy. So as much as possible you should go for the highest difficulty for a higher cactuar spawn rate. Will there be a relic draw banner for this event, and if so could you list what comes from it? No there will not be a relic draw banner for this event I don’t think. anyone knows the hitpoints from the Gigantuar ??? Try the latest game in the Final Fantasy series, FINAL FANTASY Record Keeper! Not including rewards for finishing first time and mastery, so far for 37 runs(45 stamina per run, 3 heroics) i have seen 1 gigantuar and 17 cactuar dropping 1 major and 8 greater orbs. From what i can tell the drop of which level of orb is around 50%. Considering cost of relic draw is down to 25 once per phase i’m only spending mythril above and beyond what’s needed for the draw. So far on 3 draws i’ve gotten 8 5*, 7 4* and 15 3* pieces of equipment. Now looking at value for those 75 mythril i could have done 150 runs and gotten approximately 4 major and 32 greater orbs. Enough for 1 4* ability with a little left over. This is only my opinion but having 5* equipment with possible synergy has much more of an effect on my ability to runs level 120 areas in the events. Either your data is inaccurate, or I am misunderstanding it, or your luck with orbs is TERRIBLE, and your draws with Relics is very good. My approximation of orbs for me is about 3 Greater Orbs per Mythril spent refreshing (3 Full runs per), and 1 Major Orb per 4 Mythril. That said, you’ll still average over 5 Normal Orbs per 15 stamina spent, and we will eventually have an Orb Conversion feature which will help equate less than 30 stamina into one Greater Orb, and one Major Orb into 10 Greaters if you desire those; that said, for my personal averages I am looking at about 40 Greater Orbs per 4 Mythrils spent refreshing. In other words, 75 Mythrils for me is potentially over 700 Greater Orbs. 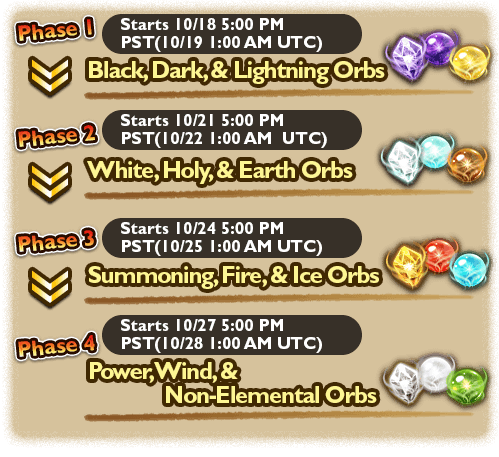 This is only orbs as well. There is an abundance of EXP to be gained, and gil as well, but I am unsure how much of that gil is going to be spent on the cost of converting orbs. i think you might want to look at your own numbers. to get 700 greater orbs for 75 mythril means you are getting 10 greater orbs per mythril spent or 1.5 per 15 stamina run. i ended up spending 20 mythril last day and got 2 major and 11 greater orbs. NOT 200! 1 mythril to me equal 6 15 stamina runs. IF and only if you got every battle against a cactuar you would see 18 cactuar for that 1 mythril. You would need to get 50% of those cactuar dropping greater orbs to get 9 greater orbs for that 1 mythril. As cactuar actually only appears 10% or so of the time there is no way you are going to get 10 greater orbs dropped per mythril spent. There absolutely no way you are getting 10 greater orbs per mythril.